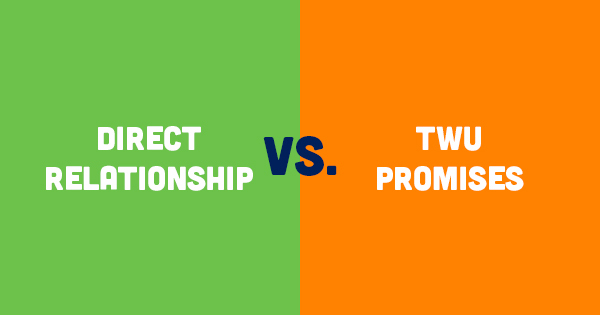 Let’s review what we have with Our Direct Relationship -VS- What TWU Promises. We will be REQUIRED to pay monthly Union Dues in order to keep our jobs! We enjoy our Direct Relationship at ZERO COST to Inflight Crewmembers. We are not required to pay monthly dues for any of the programs that provide us a seat at the table. TWU will require us to pay monthly union dues following a ratified contract. TWU had a letter from Organizing Director Steve Roberts stating we will be asked to pay "monthly dues or representation fees based on a weighted average of your hourly pay scale..." On February 5, 2018 a new letter appeared online stating monthly dues would be $35 (following a ratified contract). Pay Reviews are EVERY 2 years via IFCAT, a team of Crewmembers who examine current peer compensation & represent the needs of fellow Crewmembers via a survey. In less than 5 years, from 2015-2018, we received pay increases totaling 22.5% thanks to IFCAT's collaboration. Pay scale is negotiated via a Contract every 3-5 years AFTER an initial Contract is ratified. Keep in mind that TWU, as an example, got Allegiant pay increases of 11-23% but only after 7 years of stagnation. Since it was their first contract, “retroactive pay” did not apply, and they are required to pay dues with their pay increase! Southwest's latest contract featured a 6% increase beginning in November 2016, with just 3% increases in November 2017 & November 2018. Dynamic work rule changes are enacted on demand through collaboration with the IVC & Crewmember feedback in addition to the formal work rules review every 2 years by the Inflight Work Rules Team. New work rules and/or modifications to existing rules occur on a continuous basis, as we currently see. Work rules negotiated via a Contract ONLY every 3-5 years AFTER an initial Contract is ratified. A contract does not start from what we have now, so every work rule would need to be rewritten and negotiated. There is no telling what will end up in the contract or what the negotiating team would decide to give up in order to gain something else. Based on Crewmember feedback, we've influenced operational improvements. For example, Crew Services rolled out enhancements like call-back assist, & JETCRW upgrades. Based on our feedback, the A320 Restyling was delayed to address Crewmember concerns with the A321 SpaceFlex galley. These are just some examples of how our voices are heard to improve our work environment and operation. The Union would not be able to negotiate anything related to operational influence like Crew Services. They solely negotiate pay, benefits & work rules. There are already procedures in place to appeal a decision made by Crew Services. You can always reach out to your Team Leader, Base Manager, or Inflight Duty Lead team to look into something that does not seem right. There is also a tool on HelloJetBlue called Tell Crew Services where you can submit an event that gets escalated to Crew Services Leadership for review. In addition, as it is already, you have the right to have someone assist you in a progressive guidance meeting. Currently, all Inflight Crewmembers are allowed to bring another Inflight Crewmember to a progressive guidance meeting (Inflight Blue Book Supplement section 5.3). A grievance is a formal written complaint that a union files on behalf of an employee when the employee believes the company has made an error or committed a wrong doing. A grievance can relate to how the company is interpreting a work rule, or to disciplinary action. Grievance processes vary, but in general, an employee writes down the account of an event, the union files a grievance, and it goes through multiple levels of review to determine an outcome, ending in arbitration (which is sort of a less formal version of a trial in court). It can take months, even years, before a case gets through this process and gets resolved. In addition to the "McCaskill Bond", a federal law that protects us with seniority integration in the event of a merger or acquisition, JetBlue has done more to proactively protect it’s Crewmembers in the event of poor performance or M&A with other competitor airlines. First, JetBlue has always had a no furlough policy in place to protect us from downsizing. Second, in April 2016, JetBlue made a Seniority Integration Commitment which was created following feedback given during business meetings and collaboration with the IVC. In the event of a merger, a peer-elected committee would be formed, and if legal counsel is desired by the committee, JetBlue will assist in the hiring process and pay all legal fees and costs associated with the integration process. The final choice for legal representation will be solely up to the committee. This is a result of our direct relationship. 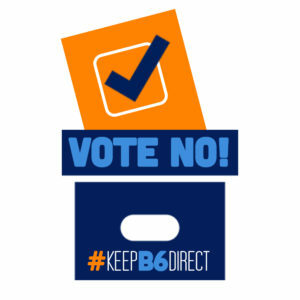 In addition to the "McCaskill Bond", a federal law that protects us with seniority integration in the event of a merger or acquisition, a Union may decide to pursue further protections in the negotiation of an initial contract, but no one can say if it will be more or less protection that what we have already. We already have a process in place to ensure terminations don't just happen without "just cause." Currently, every separation goes through five levels of review – a Team Leader, Base Manager, Director, Crew Relations and VP of Inflight. This process is in place to ensure each decision is fair, logical, legal, and in line with our values. Separating someone is not something leadership does lightly, but having a union contract isn’t going to stop a termination from occurring when the circumstances require it. Unions often talk about “job protection” as a benefit of union representation. However, with a union contract, a company is still able to make employment decisions, including terminating employees for such things as poor performance, violation of company rules, and attendance. It happens all the time. What a union contract does provide is a grievance process that ensures that terminations don’t happen without “just cause” – which means that the company must have had a good reason for the termination. We know there have been several technology issues causing headaches in recent months, ranging from FLiCA to password log-ins. JetBlue suffers from them right along with us. While they’d love to go to the store and pick up another system off the shelf, our Business Partner, Sabre, is the dominant provider of this type of technology for the entire airline industry. Additionally, building our own system is extremely expensive and such a project would leave less money to invest in Crewmembers, Customers, and growth. Delta did this, but it still has the same issue we do with managing volume. While a new crew management system may be unrealistic in the near future, our subsidiary, JetBlue Technology Ventures, shows us that technology is an issue that is top-of-mind for our leadership. A union could not negotiate for JetBlue to change its technology systems.